It’s been almost 9 years since the last Pikmin game and it feels like an eternity. With the last two debuting on the Nintendo Gamecube, it was about time that Pikmin 3 saw a release on Nintendo’s latest flagship console, the Wii U. 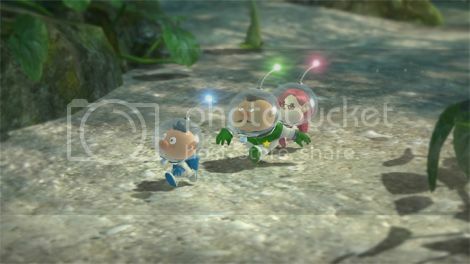 In Pikmin 3, a race of microscopic space travellers called the Koppai have mismanaged their food resources and launched a space program to find nearby planets with an alternative food source. All the teams sent out fail except one which crashes onto a planet named PNF-404. The crew, Alph, Charlie and Brittany, are burdened with the difficult task of finding food to survive whilst recovering a lost ‘Comic Drive Key’ that will allow their ship to warp back to their home. 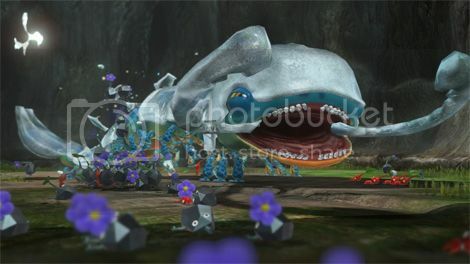 To aid them on this quest, friendly plant-like creatures nicknamed ‘Pikmin’ come to help the survivors on their journey. The Pikmin series tends to stick to the same formula and, based on its charm and uniqueness, it works. Pikmin 3 is no different, retaining the original gameplay that fans love whilst sprucing up its visuals and gameplay. Each day that passes in the game is on a strict time limit (roughly 15 minutes or more). 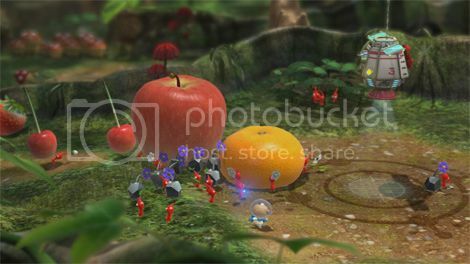 Players will have to manipulate gathering different types of Pikmin to traverse their environment fighting off foes, circumventing puzzles and most importantly gathering food in the form of fruit. After each day one single supply of food is consumed, so gathering the large fruit that litters PNF-404 is imperative as, something like a banana, can give you three days worth of supplies, giving you more time to explore. The real meat and potatoes of Pikmin 3’s gameplay is how the player controls the Pikmin. They come in various types (colours): Red (resistant against fire and good at land combat), Yellow (can be throw high up, good at combat and resistant to lightning) and Blue (can swim and are good at land / sea combat). There are also two completely new types of Pikmin: Rock (strong when thrown at enemies and can break glass objects) and Pink (can fly and are good at aerial combat). This concoction of different types creates a Lemmings like experience, where players will often have to time manage very rigidly whilst expanding their Pikmin forces and navigating different puzzles. 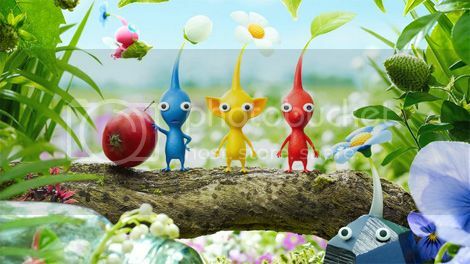 With the inclusion of the three Koppai survivors, you can split up your Pikmin into three teams and command them to go to a preset location automatically with waypoints via the Wii U GamePad. This way, you can switch to another survivor and manually take command whilst you task the other survivors to complete other routines. The gameplay is very strategic and the most enjoyable aspects come from the success of completing the ingeniously placed puzzles. Monsters are comic yet beautifully animated and defeating a monster and dragging them back to your home base is always hilarious to watch, highlighting the unique charm that the series is known for. Pikmin are spawned via a device called the ‘Onion’ that houses all your different types of PIkmin as they unlock throughout the game. Keeping a healthy surplus of Pikmin in the Onion is imperative and can be done by destroying plants or objects that are coloured to the type of Pikmin you want more of – eg: if a Pink Pikmin carry back a Pink block, more of that colour type will spawn for example. Defeating monsters or bosses is also incredibly important, as they will also resupply your surplus of Pikmin. Most of the gameplay is played via the Wii U GamePad. With this you can switch to an off-screen mode that brings all the gameplay to the GamePad’s screen. However most of the gameplay on the Pad will see you plot map navigation. Moving your character is tied to your aiming arc. A transparent aiming arc is always shown that displays were you could throw Pikmin. If you throw Pikmin on monsters, they will attack them. If you throw Pikmin at objects that can be picked up, they will pick up and transport the item back to base. As you can imagine, having the movement and aiming tied to the GamePad's left analogue stick is not the best choice in the world and later in the game this can screw you over pretty badly during hectic boss battles where you have to dodge and aim at the same time. The remedy for this is very simple, a Wii Remote Plus and Nunchuk, thus separating aiming and movement. The highlights are definitely the puzzle solving but also the boss battles. The bosses are very well presented and are incredibly challenging. You will often not defeat a boss in one day of in game time and will have to come back the next day and fight them again. Thankfully, the bosses’ health remains the same as the end of your previous fight. Another highlight was the management of Pikmin and how strategic the game is. It’ll never be a Total War game, but it will give some strategy / management fans a run for their money. The level of visual detail that went not just into the environment but also the fruit you were collecting is breathtaking. Pikmin 3 probably has the most realistic depiction of fruit that any game has had to date. Whilst the game is pretty much flawless with gameplay that flat out works, visuals that look fantastic, audio that delights and a charm that is humorous and unique, the game has a few niggles such as the odd A.I. pathing of Pikmin running into walls trying to follow you up a ramp, or the fact there really are only 5 levels (roughly 11 hours of gameplay – More if you want to collect ALL the fruit in the game). However, what you do get from this game is a very gratifying experience, something that only Nintendo seems to get when it comes to their output. I think this game deserves more DLC map content, as the gameplay style opens it up to endless possibilities; however what it comes packaged with is satisfying enough and becomes one of the more unique experiences you will play on the Wii U.